Are you homeschooling a struggling reader? Yeah, me too. Even as a reading teacher, it's a challenge! I equate it to throwing spaghetti against the wall. Some sticks. Some slides right off into a heap on the floor. That’s how guiding a struggling reader can feel. We search for solutions, the perfect one that will melt away our child’s reading challenges. We try one after another. We poke and prod, and sometimes, momentarily, we give up. We feel as though our whole success as a parent, especially a homeschooling parent hinges on our child’s reading ability. So when our children are delayed in reading, we feel off-balance and our confidence to teach them waivers. I know. I’ve been there. Multiple times. The reading teacher in me is still humbled by the emotional side of my sons’ reading struggles. I'm not immune to that not-quite-up-to-the-task feeling. Thankfully, my training and experience have helped me to evaluate the quality of reading programs so that I don’t have to throw too many handfuls of spaghetti at the wall. Needless to say, there aren’t many programs out there that meet all of these standards. The good news is that I found one that we love (and I think you will too)! Nessy Learning! It changes the atmosphere of learning to read from dreaded drills to engaging games. The effectiveness of Orton-Gilllingham based teaching for struggling readers has been proven over and over. Nessy focuses on incremental instruction so that the student is not asked to work with phonics concepts that have not yet been taught. 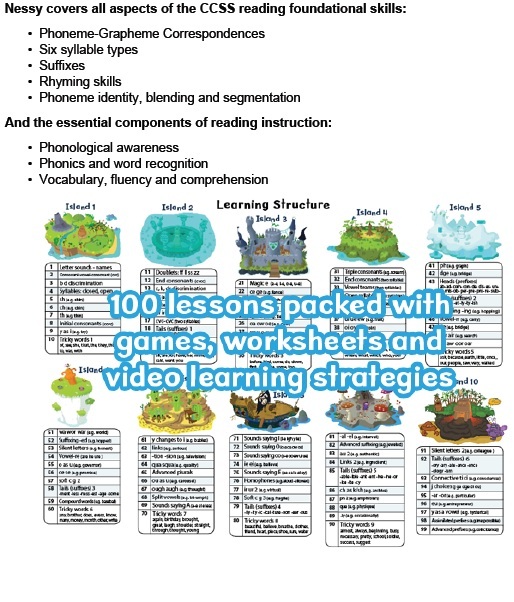 If your child needs to strengthen pre-reading skills like rhyming and phonological awareness, Nessy provides it. Blending and segmentation are practiced repeatedly to ensure that the student builds a solid experiential understanding of these essential skills. One of my favorite aspects of Nessy is the teaching of the 6 Syllable Types! Teaching these to my struggling readers has changed their approach to reading and spelling in dramatic ways. They have moved from the guess and hope-for-the-best approach to segmenting words into syllables for decoding or spelling. The syllable types are a powerful tool for all learners, but especially the struggling reader. I love, love, love that Nessy includes them. Log in to Nessy and you’ll see gameschooling at its best! Whereas struggling readers typically need to spend hours and hours practicing skills, Nessy adds some excitement to those hours. Nessy has become a wonderful addition to our reading practice. And to be honest, there are weeks when Nessy is the reading instruction for the week. I’m good with that! When my son logs on and spends even a half hour of focused time playing Banana Wheels or any of the other Nessy games, I know he’s receiving quality practice and instruction. It’s not wasted time or busy work. It is a game. It is learning. Win! Win! Win! One of the greatest worries with an online program is that it will be a one-size-fits-all approach, marching our kids through one concept after another without focusing on mastery. This only leads to frustration for everyone! Nessy Learning adjusts according to your child’s performance in the games. Additionally, you have access to reports and settings so that you are able to accommodate your child’s exact needs. Private tutoring with a licensed reading teacher can cost over $40 an hour and it is well worth every penny, but the reality is that the big price tag of private instruction is not always feasible. Nessy offers an alternative. The Parent Pack provides a yearly license for one student to Dyslexia Quest, Nessy Reading & Spelling, Writing Beach, Nessy Numbers and the ‘Dyslexia Explained’ book for less than the cost of four tutoring sessions. Nessy even offers Freebies and Discounts! I encourage you to check out Nessy Learning. Incorporating it into our weekly schedule has allowed me to catch my breath and stop throwing spaghetti against the wall!